Smartphones are technological marvels that are rewiring culture on the most fundamental levels. Green energy technology may soon provide a bounty of cheap, limitless energy with zero environmental impact. Those are fine accomplishments, sure, but robots are still doing little more than working assembly lines, vacuuming floors and, most remarkably, finding ways to make soccer even more boring than it normally is. Needless to say, robotics in the 21st century has been a bit of a letdown. Until now, that is. 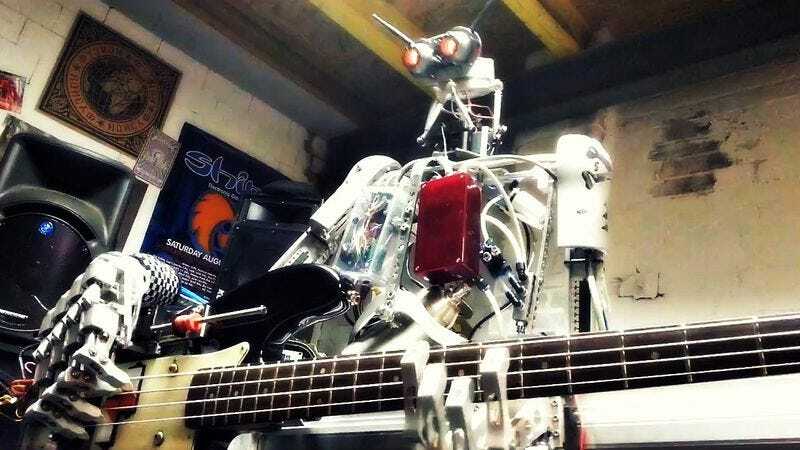 Compressorhead has finally brought robotics into a field worthy of our future masters: rock ’n’ roll. Jumping past the limitations of previous generations of robotic musicians, the trio plays the same instruments and songs as humans do, using the same equipment. But it’s done by robots, so it’s obviously infinitely better. Compressorhead’s been programmed with at least 15 covers — all instrumentals, sadly — including cuts by Motorhead (“Ace Of Spades”), Rage Against The Machine (“Bullet In The Head”), and Led Zeppelin (“Whole Lotta Love”), and appeared on the main stage at Australia’s Big Day Out last month. If you missed out, another 21st-century technology, YouTube, is there to provide a glimpse of what you missed, and open the door for a slew of really amateurish jokes about what it means to be a metal band. The BBC gets to the bottom of being "an indie"